Duke’s Zion Williamson (1) dunks against Eastern Michigan during a game earlier this season in the Blue Devils’ Cameron Indoor Arena. With his mix of high-flying acrobatics on the court and his charismatic personality off it, Williamson has emerged as the natural face of the Blue Devils and college basketball as a whole. DURHAM, N.C. — Not much gets past Zion Williamson, the wondrous talent with an out-of-this-world following on social media. Hard work is subjective, but little else in Williamson’s game is. The freshman is the nation’s only player averaging 20-plus points while shooting better than 61 percent (an outrageous 68.2 percent). He’s also the only player with at least 40 steals,, blocks and dunks. Williamson won’t turn 19 until July but already has 2.3 million Instagram followers and practically co-stars with ESPN anchors such as Scott Van Pelt and Mike Greenberg on nights and mornings after Duke games. Williamson does this in a number of ways. By including Buckmire, a little-used guard, in interviews. By giving teammates such as Besser a shoutout in Duke-produced (“Duke Blue Planet”) videos. 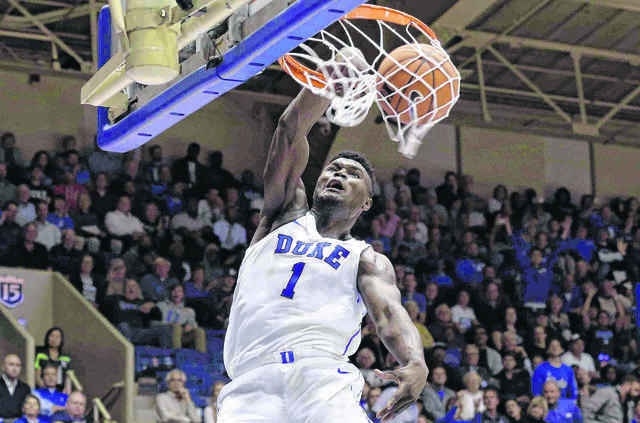 https://www.limaohio.com/wp-content/uploads/sites/54/2019/02/web1_Duke-1.jpgDuke’s Zion Williamson (1) dunks against Eastern Michigan during a game earlier this season in the Blue Devils’ Cameron Indoor Arena. With his mix of high-flying acrobatics on the court and his charismatic personality off it, Williamson has emerged as the natural face of the Blue Devils and college basketball as a whole.